Tuesday 6th December 2.00 p.m.
Wednesday 7th December 6.30 p.m. (Children in school at 6.00 p.m. please). Lacrosse – Years 4, 5 and 6 lunch times. The after school lacrosse club will be replaced by a lunchtime club for Years 4, 5 and 6. The school council have organised a film night on Thursday 1st December, this will be open to pupils from Year 1 to Year 6 and I have attached a letter to this Newsletter with all the details. Thank you to everyone who bought a Poppy. The school raised £107.66 which was a great total. The Christmas Fair is almost upon us and we are pleased to say that preparations are going well. It looks like it will be a fabulously festive event with lots of stalls for you to buy those Christmas treats. For the first time ever, we have asked the classes to create and run their own stalls. Please follow the link to find out more about the stalls and activities on offer. 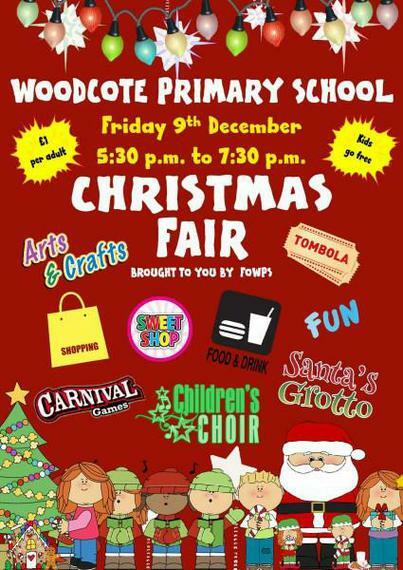 http://www.woodcote-primary.co.uk/2016/11/christmas-is-coming-on-friday-the-9th-of-december/ .